So... the Satanic Temple is suing Netflix for $50 million for copyright infringement. Please insert your own joke here. The classic visual representation of idea of Baphomet is an image created in or about 1856 by an occult historian Eliphas Levi (the “1856 Baphomet”), which is notable for its use of a seated figure, with exposed large voluptuous female breasts, androgynous arms, a seeming male lower body and a Sabbatic Goat’s head. 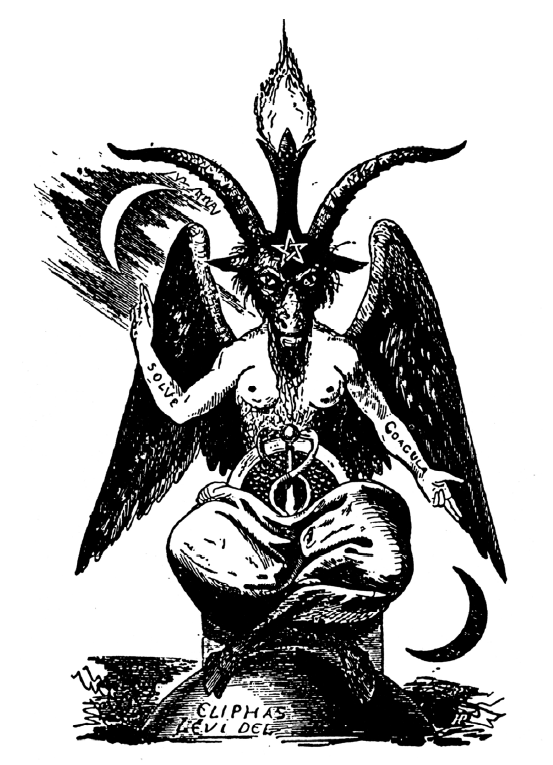 A copy of the historic Levi drawing of Baphomet is annexed as Exhibit E.
But is it infringing? First off, how much of the Temple's Baphomet is actually protectable? Not very much. The Temple notes that it made Baphomet's chest to be a male chest, rather than a female chest (to prevent courthouses from blocking their requests on the grounds that an exposed female breast -- on a mythical winged beast -- might be deemed "obscene"). The Temple also notes it added the children to the sculpture, which at least is something different. This case presents, among other things, a textbook example of the hornbook explanation of copyright protection that copyright law protects unique expressions, but not the ideas themselves. Hornbook in legal terminology does tend to mean a settled legal principle, but it's difficult to believe that the lawyers weren't going for a bit of a pun here. There's also the fair use issue. This is a statue that happens to be seen in a TV show. While there do tend to be insurance companies and entertainment lawyers who demand that every possible thing seen on a screen must first be licensed, that's not how copyright law actually works (or it would be impossible to film a ton of stuff). On the trademark side, Burstein also questions whether or not there's a valid trademark, while I'd question (if there even is a trademark) whether or not these are even competing in the same marketplace. Also, on the trademark claim, the lawyers repeatedly talk about "forbidden dilution" (which feels vaguely Satanic, now that I think about it...), but that appears to be a weird misreading of &sect 115, which notes that false designations of origin, false descriptions and dilution ARE forbidden. Admittedly, the law does not have that "are" but it's clearly implied by the title of the law which puts forbidden after the dilution, rather than before it in the lawsuit. At the very least, Forbidden Dilution, is a fun band name for some trademark lawyers. Defendants have used the TST Baphomet with Children in ways that falsely designate its origin and are misleading and false to the extent that the Sabrina Series indicates, impliedly and expressly, that the TST Baphomet with Children is a symbol of evil, associated with forced-devil worship, cannibalism, and murder. Man. The Satanic Temple is getting soft. (More specifically, what is the actually likelihood of confusion here? Even more specifically: come on, really?). Among other things, TST designed and commissioned the TST Baphomet with Children to be a central part of its efforts to promote First Amendment values of separation of church and state and equal protection. Defendants’ prominent use of this symbol as the central focal point of the school associated with evil, cannibalism and murder blurs and tarnishes the TST Baphomet with Children as a mark of TST. I totally get and support the First Amendment principles behind the Satanic Temple's attempt to get the statue installed as a creative form of protest against using the 10 Commandments at government buildings. But, it's a funny way to say you support the 1st Amendment to use that as part of your argument against a TV show that has its own 1st Amendment protections. Anyway, this case is unlikely to get very far and I'm not convinced it was intended to get very far. It's certainly not leading to the Satanic Temple getting $50 million. But... it might lead more people to watch the Netflix show. So, from that perspective, this does feel just a wee bit like a devilish PR stunt, even if that's not what it was intended to be. The Satanic Temple has been doing this kind of activism before. They like to sponsor satanic bible study and anything else where one religion gets to do something so they should to. If this was even close to being possible, don't you think the pope and his minions would have been doing this already? How often do you see Jesus or God in a movie? TV show? Are they going to trademark the word....SATAN?!?!?!?!?!? Three copyright trolls walk into a Satanic Temple. Baphomet says "Welcome home!" Honestly, being familiar with both the Satanic Temple and the new Sabrina series, I can absolutely see the problem with associating it with the Church of Night on the show. The Church is vile and evil, the Satanic temple is VERY NOTABLY not. And yes, of course there's a chance of confusion, the characters on the show go around saying 'praise Satan' several times an episode and go to school with that statue of Baphomet and then sit down to literally caniballize one of their own. At one point Zelda kills and serves a young boy to Satan for dinner. Meanwhile, the actual Satanic Temple is a bunch of nice people fighting against religious overreach. You need to remember that "the possibility of confusion" doesn't necessarily mean savvy tech journalists like you, it means all the evangelical soccer moms in Indiana whose only exposure to the Satanic Temple might be via a brief headline here or there, and then seeing it in this show. It's also possible that the Satanic Temple offered their services to Netflix as consultants and were turned down. And hurt and offended, they retaliated with a lawsuit. More recently, the ADL offered it's services to Mel Gibson's film "The Passion" and after being declined, launched an international campaign against the movie, claiming it was anti-Semitic, and as a result no Hollywood distribution company would dare touch it. It's a lesson often learned, that when some self-appointed "expert" organization offers its services as consultant to a film company, it's often easier and cheaper to simply pay them off than snub them and risk retaliation. It seems unlikely that a non-theistic group of political activists -- who promote critical thinking and don't believe in the supernatural -- would offer their services to the makers of a fantasy-horror entertainment series. Just an egotist lying for the sake of self promotion. I don't think he ever sued anyone for calling him on it, did he? I'm pretty sure the Anti-Defamation League thought "The Passion" had a weirdly modern anti-Semitic subtext to it and suggested changes. When Gibson rejected the changes, they brought their concerns to the public's attention. Are you saying they only did that because he wouldn't pay them as consultants? Before this lawsuit I didn't associate the two at all. But I do now. Just probably not for the reasons they thought. The Catholic Church was a bit too early to get a character copyright—even if the idea had existed back then, and they used all the mickey-mouse extensions they could, "God" would still have been in the public domain for over a millenium by now. Except perhaps in the UK, like with Peter Pan. Still, in terms of their desire for absolute control, just look to their history—they've gone way beyond any other group, even Disney. Replace “rights” with “privileges” and you have the Temple’s mission statement for its brand of social activism. 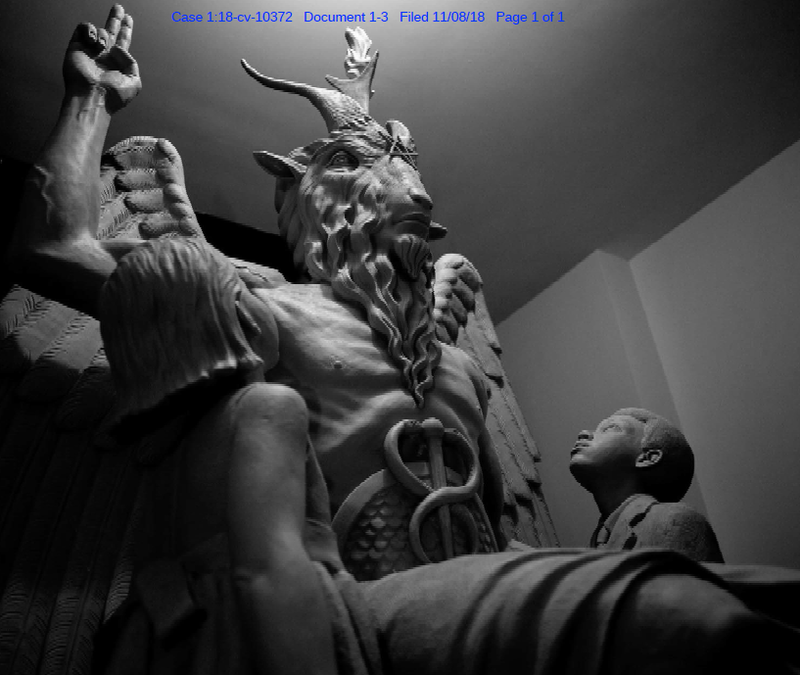 The Baphomet statue is the best possible example: Whenever a Christian group—and only a Christian group—is provided public space for obviously religious displays, the Temple threatens to install the Baphomet statue and sue the local/state government on First Amendment grounds if the government refuses to allow the installation. The whole point of such activism is to protect the wall of separation between church and state—i.e., to ensure that the government does not give to a specific religion any right or privilege that other religions cannot exercise. Oh hey did you hear Netflix has a new show based on Sabrina the teenage witch??? I heard this news story about how the Satanic Temple is suing Netflix over it abotu stealing ideas or something! We totes should binge it as soon as possible! Two copyright trolls walk into a Satanic Temple. Baphomet says, "What took you so long, John and Paul? Duffy's been saving your seats!" TST exists solely to make whiny brats feel like they have a purpose. > So... the Satanic Temple is suing Netflix for $50 million for copyright infringement. Please insert your own joke here. This should be an interesting courtroom battle between an organisation dedicated to the pursuit of evil ... and the Satanic Temple. the Sabrina Series indicates, impliedly and expressly, that the TST Baphomet with Children is a symbol of evil, associated with forced-devil worship, cannibalism, and murder. Okay, lemme see if I have this straight: Satanists are complaining that a TV show is making Satan look bad? Okay, Bender, I'll let you handle this one. With sticks, or stones? Or actual frozen water? Or is satan running a taxi service these days? One day, a journalist found Satan sleeping on a park bench in downtown Moscow, covered by Russian newspapers. Well, I could agree that it is not how copyright law is supposed to work. However, Ringgold v. Black Entertainment Television, 126 F.3d 70 (US 2d Cir. 1997). There. the court said that a total of 26 seconds of out-of-focus views of parts of a museum's poster showing a quilt infringed on the copyright of the quilt producer. The poster was visible in the background for a total of 26 seconds of a TV show. Trial court dismissed complaint, appeals court revived it. I think that's more a problem with them choosing the name "Satanic Temple" than with anything on a TV show. Don't tell Lucifer, he has a vested interest in Netflix. Good luck with copyrighting a religious symbol. Makes me wonder if Cher is behind this too, her selfish greed knows no bounds. Well that's a headline you don't see every day. "Relgious cult complains about blasphemy of its symbols." ...oh wait, you pretty much do see that every day.